Program 102: Elder Wisdom with Barbara Roberts | Wisdom of the Elders, Inc.
I’m Arlie Neskahi, and you’re listening to Wisdom of the Elders. Along the banks of the James River lies the history of the Monacan nation. Only recently, the state of Virginia granted the Monacan official Native status and now the tribe is actively pursuing Federal recognition. For the past five years, members of the Monacan nation have aggressively set out to map the history of their ancestors. The background of the Monacan is characterized by enriching family ties and legends that keep the past alive. Wisdom of the Elders talked with four Monacan elders one afternoon inside their community hall in Charlottesville, Virginia. Barbara Roberts shares their stories. In the rolling hills of Virginia, in the foothills of Bear Mountain, Chief Kenneth Branham remembers growing up in apple orchards. First, the beauty of the springtime blossoms and then the fragrance of ripe, ready apples waiting to be picked. 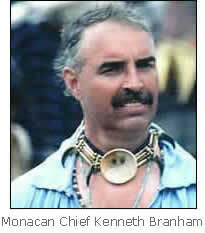 But the Chief says his strongest memories come from the elders themselves, as he listened and learned in the orchards. Those tales of tough times and the good old days taught Chief Branham about his heritage and of how the Monacan Nation began. The legend goes that the Siouan speakers which we are part of originated in the Carolinas. Some scholars say that’s where we started and migrated up the east coast, got up to around New York. There was a large group of Ojibway Indians livin’ there at that time. A lot of conflict between the two groups of people. So the Siouan people decided they would move west. When they got over to the Ohio area, a bunch of them split away from the main group, came back down through the Ohio Valley into what is now the Piedmont area of Virginia. And out of this group became the Monacan Nation, which at our peak reached an estimated population of 25,000. The Monacan people settled along the James River, in what is now Lynchburgh, Virginia. Their ancestors inhabited the region for ten thousand years. 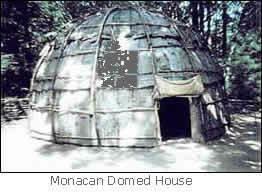 They built dome-shaped homes made of bark and reed mats. The lifestyle was mainly agricultural. They grew beans, corn and squash – the “three sisters” crops is what they called them. They hunted deer, elk and buffalo and if you stood in a clearing on the banks of the James River, you’d see the Blue Ridge Mountains in the background with their round, blue silhouette. One of the stories that first came out was the encounter that occurred in 1608 when Captain John Smith and his men brought a dugout canoe up the river, and were looking for Monacan territory. They had heard that there might be gold out there. 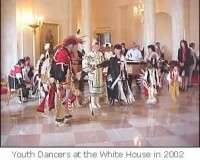 Monacan historian Karenne Wood works for the Smithsonian’s National Museum of the American Indian. So they were very interested in meeting our people. But when our people met them, it was with a volley of arrows, (chuckle) because they were shooting at them. And Captain John Smith found a Monacan man who had been left behind, he was wounded in the skirmish. Our people disappeared after they shot the arrows at the white people. 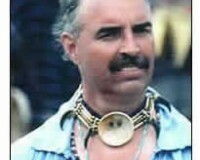 And then Captain John Smith went up to this man and said “Why have you come to us in anger because we came to you in love?” and this man told them that his name was Amerolak and the reason that they had shot the arrows was because there was a prophesy in Monacan legend that said the white people would come and they were coming from under the world to take the Indians people’s world away from them. We felt that that was a pretty prophetic statement, considering what happened to our folks later on. By the year 1740s or early 1750s, we had been decimated by diseases that were brought in by the Europeans – mainly smallpox. We would have been reduced from 25,000 to probably less than 500 scattered out through the Piedmont. 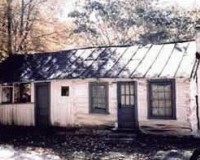 The group that lived here in this area moved back into the mountains of Amherst County and that’s where our headquarters is located today. The Monacan have even started a movement to buy back the land on Bear Mountain. So far, they own 184 acres out of a total of twenty four hundred, which is their ultimate goal. Karenne Wood also serves as program director for the Monacan Nation. She’s charged with researching Monacan history so that future descendants will have an official record of events that shaped their history. She describes this task as an honor, and a challenge. It’s a little bit more difficult to piece together the history of our people during the 1800s, particularly during the Civil War era, because there was so much going on in Virginia at the time. A lot of the courthouses were burned. Records were destroyed. So were the people and their culture. Racism against the Monacan ate away at the core of this people. But perseverance of the human spirit was no match for the newcomers’ oppression. A long-used tactic to keep people in their place was to cut off the education of the children. Tribal elders like Hattie Hamilton remember what that was like. I was born and raised here at Bear Mountain. I belong to St. Paul ‘s Episcopal Church. I went to the eighth grade, which was all we were allowed to go at that time. We wasn’t allowed to go to high schools or anything. Typical of many disenfranchised peoples, religion rema ins a focal point of hope. Chief Branham says the town church has been the center of the Monacan people since 1908. And if the walls of the church had ears it would have heard many prayers pleading for comfort from the pain of racism. We didn’t know what racism or, really prejudice was until we went into the public schools. And of course that was a big shock to all of us young people that were in the first group that went into the public schools in 1963. I went in as a fourth grader, and made friends very quickly. But after awhile, some of the kids started pulling’ away from us, and not playing’ with us. And when I asked, they would reply that their moms and dads told them that we weren’t the kind of people they should be associating’ with. Resilience is critical to the preservation of any culture. But to Branham, it especially characterizes the Monacan people. My dad would always tell me that I’m no better than anybody else, but nobody else was better than me, that we were all created and made who we were for a reason. I just happen to be Monacan Indian. And it’s up to us to find our own path – why we are here, and, and the purpose that we have in bein’ here on earth. But it’s also very uplifting to see how much things have changed for us since the 1960s. Determined not to be excluded from education, Karenne Wood believes the Monacan have found their way toward personal, spiritual, and educational achievement. You know, this is only 40 years – in my own lifetime – that people have been getting master’s degrees, nursing degrees. We have a doctor. We have a colonel. And we’re very proud of that. Because we feel like, you know, in the span of only a couple of generations, we have lifted ourselves from a position of not being able to read – and therefore powerless – into a new age for our people, whe re we are able to articulate what our problems are and work towards them. For any culture, it’s important to be able to articulate and chronicle the history. This has been a daunting challenge for historical researcher Wood who says recent tasks of recording and preserving Monacan history has met success. I feel really good about what we’ve been able to do in the last five years as a people, to reconstruct – and we are reconstructing – our sense of ourselves. We have a very good idea about how we lived before European contact and what has happened to us since. And we still have a lot of our pieces intact, in terms of culture. And we have a lot of work to do with our language, reconstructing a sense of story, I guess. But we feel like most of the really important pieces are there. The values are there. And that is essential. That’s, you know, we feel makes you “Indian” is your connection to the land, your connection to the people who came before you, your understanding of your own responsibility to the people and creatures who come after you. The history of one people: the Monacan, offered to the world as one component in the collective history of all people. For Wisdom of the Elders, I’m Barbara Roberts. Today’s Elder Wisdom segment featured the Monacan nation. It was upon Monacan ancestral land where Thomas Jefferson established his home, Monticello, just outside Charlottesville, Virginia. Monticello is the site of the 2003 Lewis and Clark Bicentennial kick-off. As the National Park Service unfolds this commemoration listen for a special series of Wisdom of the Elders featuring stories focusing upon culture and history of Native Nations along the expedition route. I’m Arlie Neskahi. You’re listening to Wisdom of the Elders.